The Begin Chair from Balanced Body transforms sitting at your desk into an active experience. It is the only ball chair that promotes healthy posture with adjustable lumbar support. Begin your day with a healthy outlook! Original concept by Pilates instructor Maria Mankin, developed in collaboration with Balanced Body®. The Begin Chair is available exclusively from Balanced Body, and is a beautiful and functional addition to your home or office. 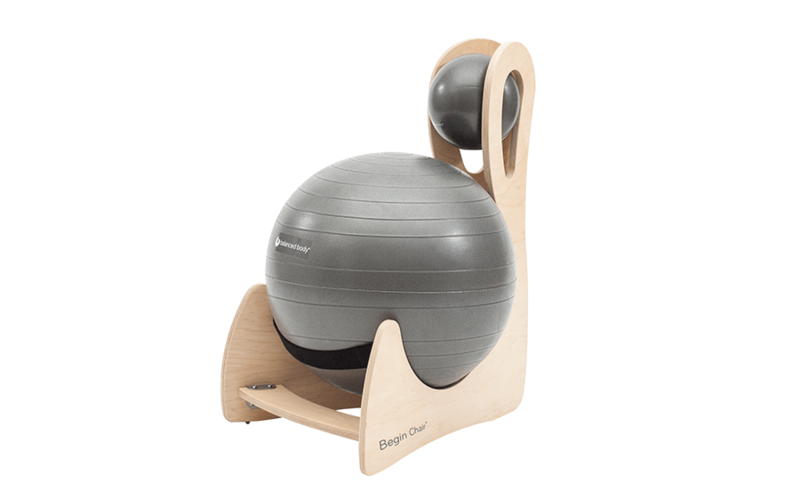 The Begin Chair is the only ball chair available that adjusts to your back's natural curves. The small ball in back adjusts up and down, or in and out, to fit every spine and provide comfortable back support. It will provide friendly yet firm feedback if your posture deteriorates. The large fitness ball (21.65”/55cm) is our highest quality, burst-resistant ball. It provides the right amount of instability to activate core muscles. If needed, adjust your seated height by slightly deflating the ball. Back away from your desk during the day, and the chair is also great for a seated exercise break. Balls are Storm gray and must be inflated (pump included). Patented chair frame of premium stratified maple and hardwood core. Beautifully designed and solidly built. Needle pump to inflate balls. Chart with suggested seated exercises.